GirfanovaV.V., Gevorgyan A.G., Velkin V.I. Abstract: The article is about the possibility of applying nanofluids in heat supply systems as a coolant. The most effective nanofluids were selected by analyzing the thermal conductivity, concentration, size, mass, and velocity of nanoparticles. It is presented the dependences of the heat transfer coefficient of a nanofluid on the Reynolds number and the heat transfer coefficient on the volume concentration. According to calculations, with the addition of 1% vol. of nanotubes to the coolant path that gives heat in the evaporating section of the heat pump, the heat transfer coefficient of a nanofluid increases by 100%. Keywords: nanofluid, nanoparticles, heat supply system. The use of nanofluids in heating and ventilation systems can give a significant increase in heat transfer. For the use of nanofluids as a coolant it is necessary to have the knowledge of their thermophysical properties. For this purpose we have worked on analysis of nanoliquids researches. In works [1, 3, 4] on the study of heat transfer in nanofluids it is demonstrated heat conductivity of suspensions of ultradisperse oxides of aluminum, silicon and titanium in water at volume concentration about several percent, exceeds the thermal conductivity of pure liquid by tens of percent. Results of experiment with nanoparticles of various size show that heat conductivity of liquid on the basis of larger particles is rather well de-scribed by theory of Maxwell . Choi ES, Brooks JS, Eaton DL, Al-Haik MS, Hussaini MY, Garmestani H, Li D, Dahmen K: Enhancement of thermal and electrical properties of carbon nanotube polymer composites by magnetic field processing. Journal of Applied Physics; 2003. Wang X, Xu X, Choi S U S: Thermal conductivity of nanoparticle fluid mixture. Thermophys. heat trans; 1999: 474–48. Maxwell JC: A treatise on electricity and magnetism(vol. 2). Oxford: Clarendon Press; 1881. Rudyak VYa: Statisticheskaya aerogidromekhanika gomogennykh i geterogennykh sred, T. 2: Gidromekhanika[Statistical aero hydromechanics of homogeneous and heterogeneous environments, vol. 2: Hydromechanics]. Novosibirsk: NGASU edition; 2005. Anakulov MM: Vliyaniye uglerodnykh nanotrubok na izmeneniye teplofizicheskikh i elektrofizicheskikh svoystv vodnogo rastvora etilenglikolya 65 (antifriz) i vody[Influence of carbon nanotubes on the change of thermophysical and electrophysical properties of an aqueous solution of ethylene glycol 65 (antifreeze) and water]. Moscow; 2014. 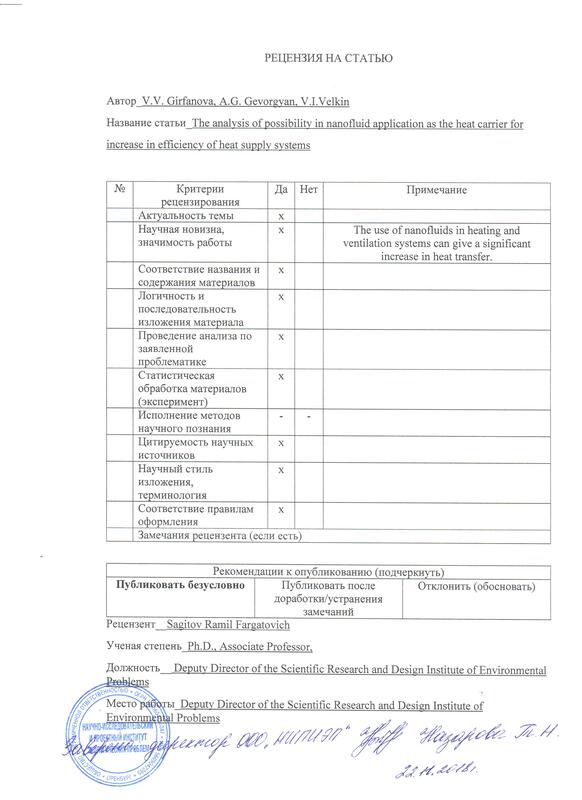 Trubitsyna GN, Frolikova VS, Barzenkova VV: Otsenka vozmozhnosti ispol'zovaniya nanozhidkostey v sistemakh teplosnabzheniya i ventilyatsii[Evaluation of the possibility of using nanofluids in heat supply and ventilation systems]. In: Mezhdunarodnaya nauchno-prakticheskaya konferentsiya «Molodoy uchenyy - vyzov i perspektivy»[International Scientific and Practical Conference "Young Scientist: Challenge and Prospects"]: Moscow; 2016. Danilov VS, Korzhavin SA, Shscheklein SE, Velkin VI: Experimental research of efficiency of the combined system of solar heat. International Scientific Journal for Alternative Energy and Ecology; 2012. Velkin VI, Shkolniy AV, Kirillov MP, Achkeev MV: Swirler, RUS 69942; 16.07.2007.